Park rangers note that summer is the busiest season and often the rainiest (monsoon season is July through September), which makes for dramatic vistas. Wildflowers, like these in the park's backcountry, bloom March through October. 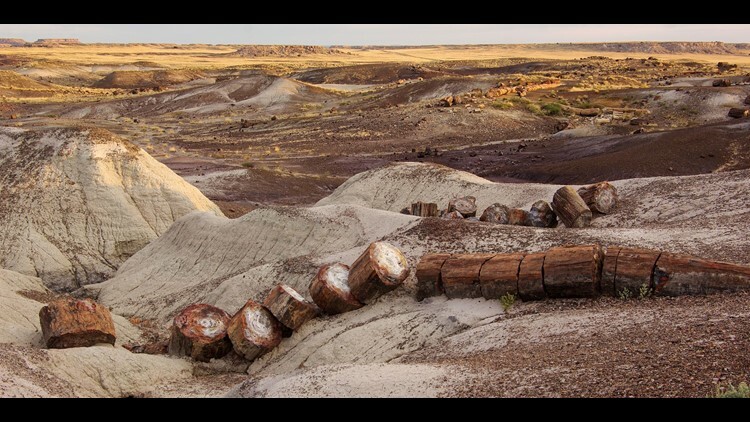 If driving from the north and heading south, enter Petrified Forest National Park off of I-40 at exit 311, and drive through the park to the exit at Highway 180. The drive allows you to see the entire park without backtracking. Or, if you’re traveling from south to north, follow the signs on Highway 180 (I-40 exit 285 at Holbrook) and enter the park from the south; this route also avoids backtracking. Be sure to stop along the way and really take in the natural beauty that surrounds you. Recommended overlooks that provide panoramic views of the park’s stunning Painted Desert section include Tiponi, Tawa, Kachina, Chinde, Pintado, Nizhoni, Whipple and Lacey Points. Learn about the petrified wood and the Triassic-era fossils that can be found within the park at the Rainbow Forest Museum, near the park’s southern entrance. Park staff say that visiting the Painted Desert Inn National Historic Landmark is a must, and a terrific way to see wonderful views of the Painted Desert. Another terrific way to experience the park is by lacing up your hiking shoes and hitting the trails. A one-way spur road from the main park road leads to Blue Mesa and a one-mile loop trail in a badlands setting. As well as the 0.4-mile Giant Logs loop (pictured); 1.6-mile Long Logs loop; and the 2-mile roundtrip Agate House trail. The Arizona landscape is home to plenty of wildlife, and within the park you may spot Gunninson’s prairie dog (pictured), meadowlark, the Arizona tiger salamander, bullsnake, golden eagle, and even coyote and bobcat. The park staff also notes that, for birders, the Painted Desert Visitor Center Plaza and the Painted Desert Rim Trail are good areas to see various species of birds. Those species include western tanagers, hermit warblers and long-earred owls (pictured). Interested in southwest archeology? You’ve come to the right place. Visit Puerco Pueblo, a large archeological site that was a village about 600 years ago with as many as 200 people living there; a 0.3-mile loop trail from the Puerco Pueblo parking lot will take you there. Agate House is a small pueblo build from chunks of petrified wood over 900 years ago. More than 650 petroglyphs created by Puebloan people who lived, farmed and hunted along the Puerco River between 650 and 2,000 years ago, are found at Newspaper Rock; borrow a spotting scope for up-close viewing. A woman visits iconic Old Faithful in 1900, six years before the site was made into a national monument. 20. Yosemite National Park - 4,336,890: First protected in 1864, Yosemite National Park in California is best known for its waterfalls. Within its nearly 1,200 square miles, you can find deep valleys, grand meadows, ancient giant sequoias, a vast wilderness area and much more. 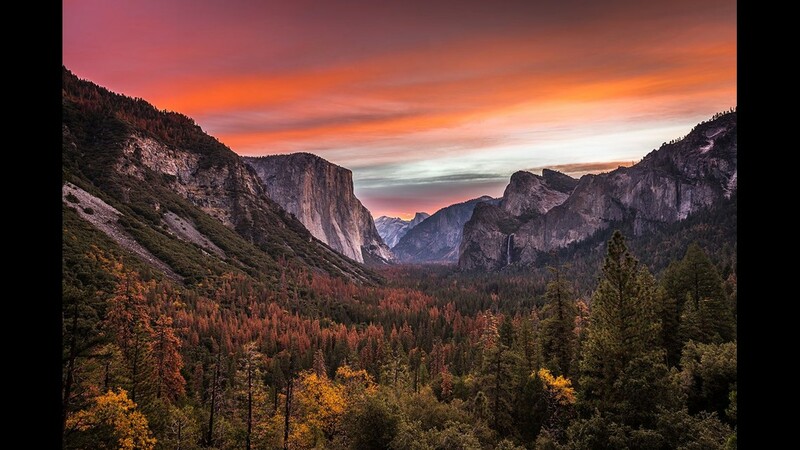 One of the “crown jewels” of the National Park Service, Yosemite is a bucket list destination for any nature lover, attracting more than 4 million visits last year. 19. Rocky Mountain National Park - 4,437,215: Gorgeous in every season, Rocky Mountain National Park in Colorado encompasses 415 square miles of spectacular mountain landscapes. Visitors can drive Trail Ridge Road for epic views, watch majestic wildlife or hike to some of the most picturesque places in the country. If this amazing photo of a moose and a rainbow doesn’t make you want to go there, then nothing will. 18. Statue of Liberty National Monument - 4,441,988: "The Statue of Liberty Enlightening the World" was a gift of friendship from the people of France to the United States and is recognized as a universal symbol of freedom and democracy. The Statue of Liberty was dedicated on October 28, 1886, and designated as a national monument in 1924. 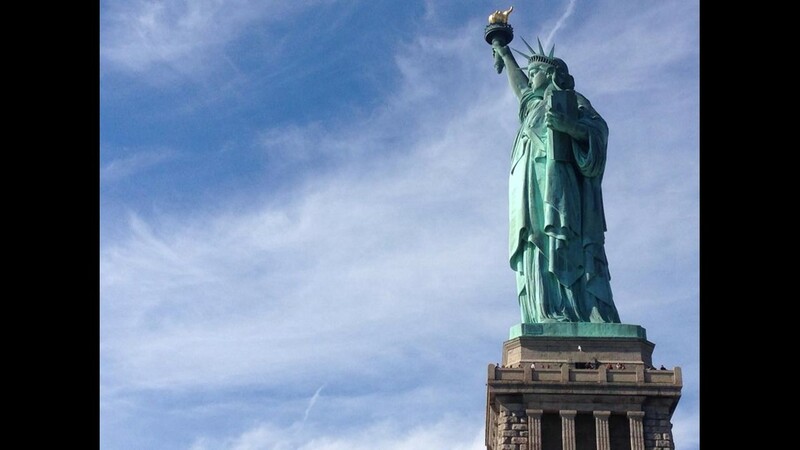 Standing proudly in New York Harbor, Lady Liberty has inspired generations of patriots and immigrants. Last year, almost 4.5 million people visited Lady Liberty. 17. San Francisco Maritime National Historic Park - 4,493,519: Located in the Fisherman's Wharf neighborhood, San Francisco Maritime National Historical Park offers the sights, sounds, smells and stories of Pacific Coast maritime history. It’s no wonder it was one of the most visited parks in 2017. A fleet of historic vessels are part of the park, giving visitors a chance to travel back to the 19th century. 16. Zion National Park - 4,504,812: Zion National Park in Utah boasts some of the most scenic landscapes in the southwestern U.S. Within its 229 square miles are high plateaus, a maze of deep sandstone canyons and the gorgeous Virgin River. The soft scents of pine and juniper drift on the air. A winter sunset coloring the sky above this dramatic scene is an unforgettable experience. It’s no wonder that 4.5 million visitors explored this park last year. 15. Glen Canyon National Recreation Area - 4,574,940: Encompassing over 1.25 million acres, Glen Canyon National Recreation Area offers excellent opportunities for water-based and backcountry recreation. The recreation area stretches for hundreds of miles from Lees Ferry in Arizona to the orange cliffs of southern Utah -- featuring scenic vistas, geologic wonders and a vast panorama of human history. 14. Castle Clinton National Monument - 4,737,113: Located at the southern tip of Manhattan Island, Castle Clinton National Monument stands where New York City began. The 207-year-old fort represents not only the city’s growth, but the growth of a nation. Initially intended to prevent a British invasion in 1812, the fortification has transformed over the years to welcome theatergoers, immigrants, sightseers, and now, millions of visitors to New York Harbor. 13. Independence National Historical Park - 4,790,758: The events at Independence National Historical Park in Philadelphia helped define our nation at its founding. Visitors to Independence Hall can see the room where the Declaration of Independence and the Constitution were written. Here you can walk in the footsteps and hear the echoes of George Washington, John Adams, Thomas Jefferson and Benjamin Franklin. The famous Liberty Bell is also on display here. No wonder so many people visit here every year. 12. Chesapeake & Ohio Canal National Historical Park - 4,859,573: Running 184 miles from Washington, D.C., to Cumberland, Maryland, the Chesapeake & Ohio Canal National Historical Park offers as much adventure as you can handle. Hiking and biking on the towpath is a favorite activity for locals and visitors alike. With so much history and nature to experience, you should get outside this week to enjoy the fall colors. 11. World War II Memorial - 4,876,842: Between the Washington Monument and the Lincoln Memorial on the National Mall in Washington, D.C., the World War II Memorial honors a generation of people who united to fight for freedom and democracy. A powerful symbol honoring the people who sacrificed on the battlefront and the home front, the large outdoor memorial contains quotations and artwork that relate the immensity and importance of the Allied victory in the largest conflict in human history. 10. Vietnam Veterans Memorial – 5,072,589: Over 58,000 names are etched into the Vietnam Veterans Memorial in Washington, D.C., in a moving tribute to those who died serving our country. It’s one of many memorials, cemeteries and battlefields across our country that help remind us of the extraordinary sacrifices made to keep us united and free. 9. Grand Canyon National Park – 6,254,238: Sun rays shine through clouds to light up the North Rim of Grand Canyon National Park in Arizona. It’s views like this that made it the 8th most visited national park in 2016. If you’re looking to explore the Grand Canyon with less crowds, the North Rim provides serenity and spectacular views. Even though the canyon is up to 18 miles wide, the drive from the South to North Rim is over 200 miles. 8. Natchez Trace Parkway – 6,326,062: One of the most scenic parkways in America, Natchez Trace Parkway runs 444 miles through Mississippi, Alabama and Tennessee. Passing stunning landscapes and pausing at hidden cultural treasures, traveling the Trace is a pleasure by foot, bike and car. The parkway hosted more than 6 million visitors last year. Particularly beautiful in the spring and fall, we recommend visiting the Cypress Swamp for a little dose of spooky fun. 7. George Washington Memorial Parkway – 7,562,793: Being stuck in D.C. traffic can be a painful experience, but a drive along the George Washington Memorial Parkway in Virginia is a delight. With outstanding views of the Potomac and plenty of hiking and biking trails, the park is a destination for both visitors and locals. Some popular stops near the parkway include the U.S. Marine Corps Memorial and Great Falls Park (pictured). Get to the falls early for a spectacular sunrise. 6. Lake Mead National Recreation Area – 7,882,339: Lake Mead National Recreation Area was established in 1964, making it the first national recreation area in the U.S. Located in Nevada and Arizona, Lake Mead National Recreation Area offers year-round recreational opportunities for boating, fishing, hiking and sightseeing with its contrast of desert and water, mountains and canyons. 5. Lincoln Memorial – 7,956,117: At the west end of the National Mall in Washington, D.C., the Lincoln Memorial stands in tribute to President Abraham Lincoln. 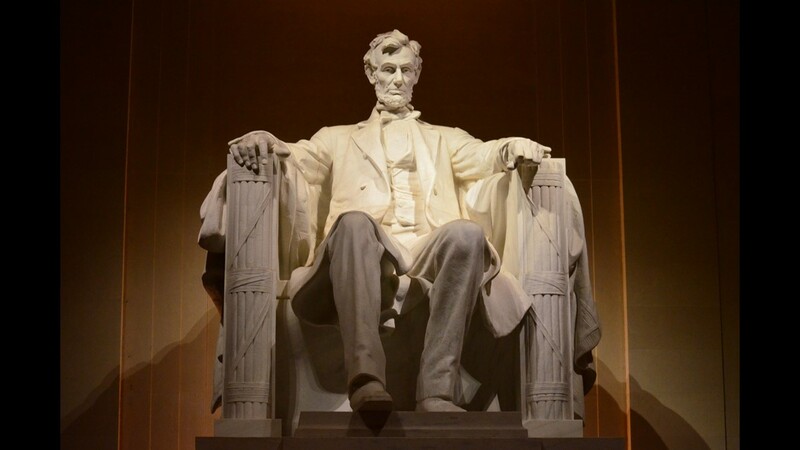 Modeled after the Parthenon in Greece (the birthplace of democracy), the Lincoln Memorial attracts visitors from all over the world -- over 7.9 million in 2017 -- to be inspired by Lincoln’s words and accomplishments. 4. Gateway National Recreation Area, Staten Island, N.Y. – 9,190,610: Stretching across land and water south of New York City, Gateway National Recreation Area serves as a peaceful oasis within reach of America’s largest city. With recreational opportunities and cultural sites in Sandy Hook, New Jersey and Jamaica Bay and Staten Island, New York, you’re sure to find something fun and interesting to experience. We recommend exploring Jamaica Bay Wildlife Refuge for great birdwatching and even greater sunsets. 3. Great Smoky Mountains National Park – 11,338,893: Sunrise from one of the most beautiful places on the east coast: Great Smoky Mountains National Park. Ridge upon ridge of forest straddles the border between North Carolina and Tennessee. This photo of the park’s rolling mountains as first light illuminated the gorgeous fall colors shows why over 11.3 million people visited Great Smoky Mountains last year. 2. Golden Gate National Recreation Area – 14,981,897: Here’s a beautiful pic from the second most visited national park in 2017: Golden Gate National Recreation Area. Located in San Francisco, Golden Gate is one of the largest urban parks in the world, offering visitors a chance to connect to nature and learn more about the area’s rich culture and history. 1. Blue Ridge Parkway – 16,093,765: Long-range vistas, rolling mountains and pastoral landscapes, Blue Ridge Parkway is America’s favorite drive, and we can definitely see why it was the most visited national park location in 2017. 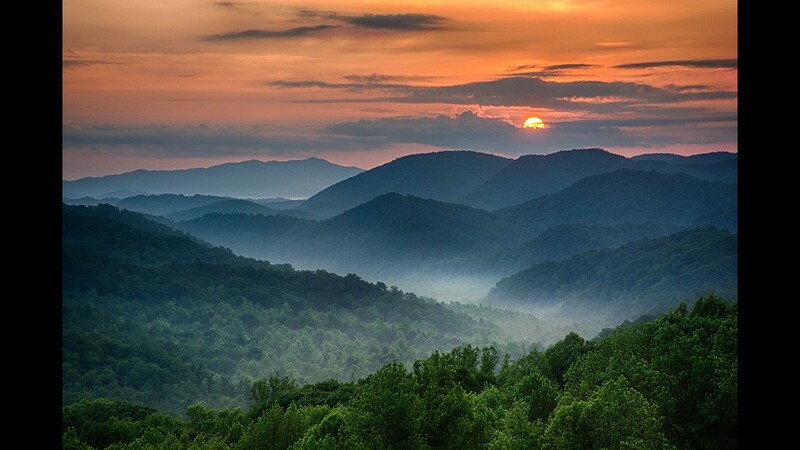 The parkway meanders for 469 miles, connecting Shenandoah National Park in Virginia and Great Smoky Mountains National Park in North Carolina and providing opportunities for enjoying all that makes this region so special.